The da Vinci Si Surgical System will be at the CHI Memorial Hospital Hixson Health Expo for demonstrations. 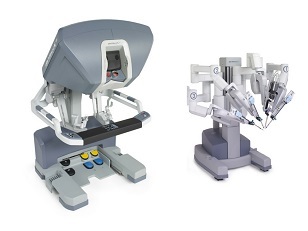 Guests will be able to sit at the surgeon console (L) and work through a simulation using the robotic instruments on the patient cart (R). CHI Memorial Hospital Hixson will host a Health Expo on Monday, April 30 from 4-7 p.m. The community is invited to join them for a variety of health education, screenings and demonstrations. Attendees will have the opportunity to get hands-on experience with the da Vinci Surgical System, the same robotic-assisted surgery technology their surgeons use. "Sit in the surgeon’s chair, peer into a magnified 3D high-definition, and use your wrist and fingers to operate the robotic instruments," officials said. To schedule a screening at the CHI Memorial Hospital Hixson Health Expo, call 423-495-7101. Educational booths include MaryEllen Locher Breast Center, Team Orthopaedics, North Park OB/GYN, CHI Memorial nutritional services, CHI Memorial Rees Skillern Cancer Institute, Susong Dermatology, USA Surgery and da Vinci surgical system: minimally invasive robotics demonstration. CHI Memorial Hospital Hixson is located at 2051 Hamill Road in Hixson.